The Mighty Thor is what Marvel called their version of the Norse God. Marvel’s God of Thunder did not have red hair from legend but was a very powerful guy. 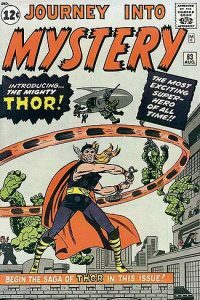 The character first appears in Journey into Mystery #83 (August 1962) and was created by editor-plotter Stan Lee, scripter Larry Lieber, and penciller Jack Kirby. Debuting in the Silver Age of Comic Books, the character is based on the Thor of Norse mythology. Before this issue Thor had been gone from the Marvel Comics for three years. Previously he had witnessed the death of his Father Odin and became the Lord of Asgard (the realm of the Norse Gods) and took on the supreme Odin-power as a right of rule. Later in a great battle Loki and Surtur attacked Asgard and brought on Ragnarok. The war left many of Thor’s allies, such as Sif and the Warriors Three, dead. While Asgard succumbed to Ragnarok, effectively wiping the Asgardian world from existence, Thor sought out the gods known as Those Who Sit Above In Shadow. Thor refused an offer to join them, instead confronting them in battle. Thor destroyed Those Who Sit Above In Shadow as Asgard died. The Odin-power congratulated Thor on succeeding at his greatest mission. Thor then closed his eyes, apparently joining his people in death. Thor #1 is the return of Thor. Marvel Comics Catalog: Not a clone! Not a robot! Not an imaginary story! The God of Thunder is officially BACK! You’ve waited for it, you’ve demanded it…and we say thee YEA! 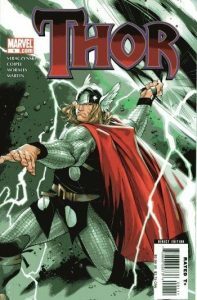 The Odinson comes roaring to life in this highly anticipated ongoing series by red-hot superstars J. Michael Straczynski and Olivier Coipel. But how does a god return from Ragnarok? J. Michael Straczynski was a good choice to write the relaunch of one of Marvel’s longest running series. His skill in conveying the drama of Thor’s long life and the necessity for his return is excellent. The resurrection of Doctor Blake as a Thor personality was brilliant. Although the plot is slow moving Straczynski is careful in the respect he shows one of Marvel favorite characters. Oliver Coipel’s art work is the new standard of the Norse artwork. Very Regal and Godlike. New fresh look for Thor and his Asgarians was needed for this new introduction of Thor. A great place for new readers to jump on with the Straczynski and Coipel creative team. Thor #1 is what you would expect in America’s number one comic publisher Marvel. This issue did not disappoint the many Marvel fans clamoring for his return. Thor is back and the Marvel Universe will never be the same without him. “How do you make someone stronger than the strongest person? It finally came to me: Don’t make him human — make him a god. I decided readers were already pretty familiar with the Greek and Roman gods. It might be fun to delve into the old Norse legends…. Besides, I pictured Norse gods looking like Vikings of old, with the flowing beards, horned helmets, and battle clubs. Journey into Mystery, needed a shot in the arm, so I picked Thor to headline the book. After writing an outline depicting the story and the characters I had in mind, I asked my brother, Larry, to write the script because I didn’t have time. …and it was only natural for me to assign the penciling to Jack Kirby.